Clinica MCR are a cosmetic dentistry and facial aesthetics clinic in Manchester. In 2017, a team of dentists with years of experience came to Embryo when they wanted to open this cool, high-end business targeting a young and affluent audience. We created their brand identity, designing their logo and outdoor signage, as well as their stunning new website. We then undertook search engine optimisation, to help the website perform better on the search engines. Clinica MCR is a brand new business competing in a saturated marketplace. Although facial aesthetics treatments have become increasingly popular over the past few years, the number of businesses, beauticians, salons and clinics providing them have boomed too. It was important to create a brand that allowed Clinica MCR to stand out from the busy crowd. It was also important to demonstrate to their online audience that their treatments are affordable and most importantly are performed by expert dentists, doctors and nurses. It was key to create a sense of trust, demonstrate the experience and professionalism of the business, whilst creating a brand look that is as beautiful as they help their clients to be. 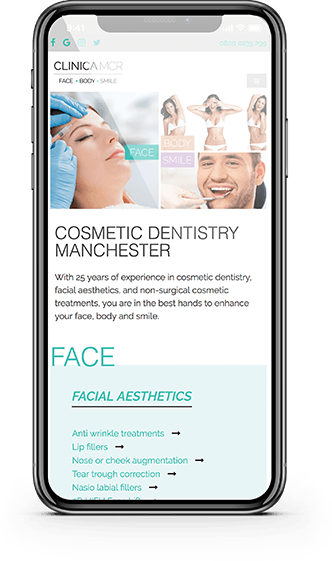 Clinica MCR are in the cosmetic and beauty industry, so it was crucial to make sure that the aesthetics of their new website were absolutely on point. We decided on a colour pallette of calming pastel colours with plenty of white space. The navigation menu mirrored the logo, with the different treatments grouped under ‘face’, ‘body’, or ‘smile’. The clinic prides themselves on providing excellent customer service, so we wanted to share the words of their delighted clients with the visitors to the website. The CSS used throughout the user journey emphasises each section of the site, drawing the eye to the next segment. The transitions are smooth and calm, just like the atmosphere that is created at the clinic. One of the main things our client wanted to promote was the finance options that are available at the clinic. It was important to make sure that this promotion was in keeping with the beauty of the website and didn’t look tacky, but that it was still very visible to the website user. We achieved this with a combination of CSS and a brightly coloured call to action button. We designed Clinica MCR a fresh, clean and beautiful logo with a fine, modern font and dainty details. The brand colours are on trend but do not alienate an older, more affluent audience. The clean lines show clinical precision and the predominance of the white signifies hygiene and purity.